I admit I was highly skeptical of DC Comics’ plan to relaunch its entire line of comics as the so-called “New 52.” Relaunches – or, as I refer to them, “excuses to print a new issue No. 1 – a more than a dime a dozen, and never seem to last even a dozen years anymore. But reading the revamped line has led to some pleasant surprises. However, DC’s latest attempt to change its logo is a total flop, in my opinion. The instant I saw it I christened it the “DC Scab,” because that’s exactly what it looks like! Loud, fast-moving, violent and filled with explosions and wisecracks, it’s hard to imagine a more faithful adaptation of the explosion-laden, wisecracking TV series. Befitting the larger venue, the movie characters feel bigger: Bradley Cole’s Templeton “Faceman” Peck is much more in-your-face; brash and boastful, rather than coolly confident. B.A. Baracus gets fleshed out much more fully by Quinton “Rampage” Jackson than Mr. T was ever allowed to do on the small screen. 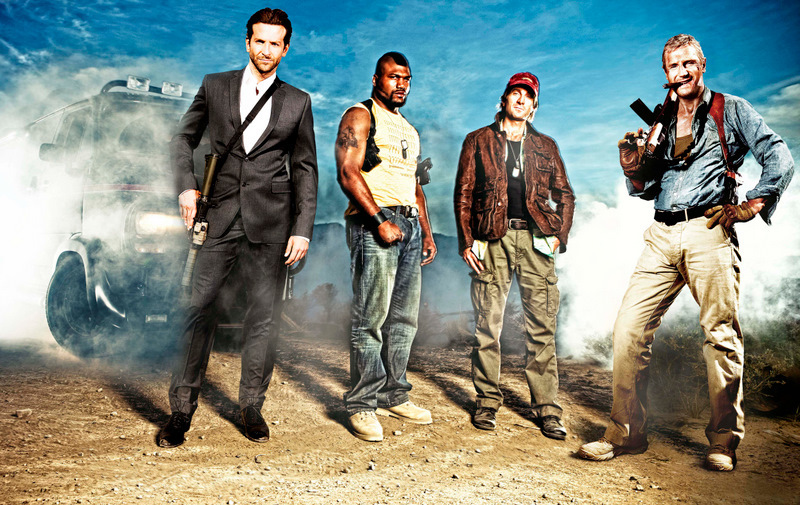 And Sharlto Copley’s (District 9) “Howlin’ Mad” Murdock is completely divorced from reality – touching down only occasionally to refuel before taking off on another flight of fancy. Only mastermind Hannibal seems smaller than he was on TV, perhaps because Liam Neeson, as the acting heavyweight in the cast, chooses to actually play him as a thinker, even though his plans are even more outrageous than the wild scams George Peppard dreamed up on a weekly TV budget. 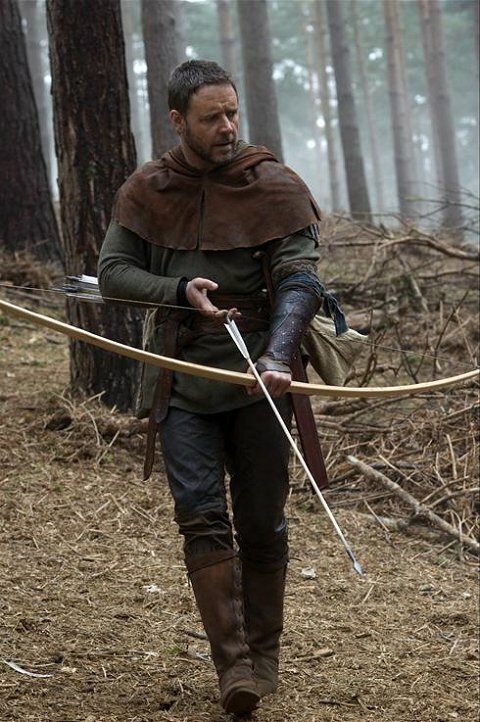 Honestly, I don’t think the world needs another Robin Hood movie. And apparently Ridley Scott, Russell Crowe and co. agreed, because their new Robin Hood is in no way, shape or form a Robin Hood movie. There is no robbing the rich and giving to the poor, and while we do meet Little John, Allan A’Dayle and Will Scarlett, this Friar Tuck keeps bees and brews mead, and Maid Marion is a longbow-firing noblewoman trying to protect her land from bands of marauding feral children. Oh, and “Robin Longstride” never even meets the Sheriff of Nottingham! 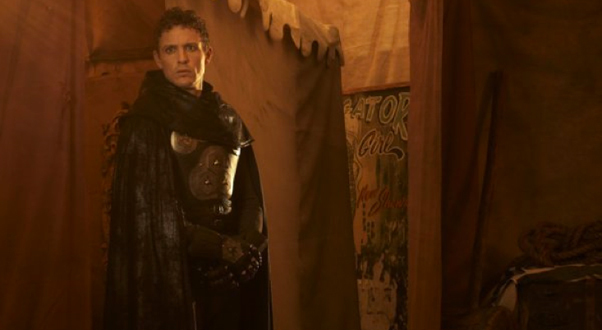 The story follows Robin and his companions John (Kevin Durand – Keamy from LOST), Allan (Alan Doyle), and Will (ER’s Scott Grimes) as they attempt to return home with King Richard the Lionheart (Danny Huston) after a decade of waging the Crusades. The king, of course, doesn’t make it, so Robin and the boys seize and opportunity to impersonate knights and ferry the royal crown back to England. Once in Nottingham, Robin discovers that not only does he like pretending to be Robert Loxley, he likes Loxley’s wife, Marion (Cate Blanchett), so he decides to stick around. Meanwhile, Godfrey (Mark Strong), decadent Prince John’s (Oscar Isaac) hatchet man, runs around apparently killing barons and pillaging at will. The nobles bluster about a charter of rights (a concept that would eventually become Magna Carter). And Godfrey is also acting as an agent provocateur for the French, who are looking to invade.